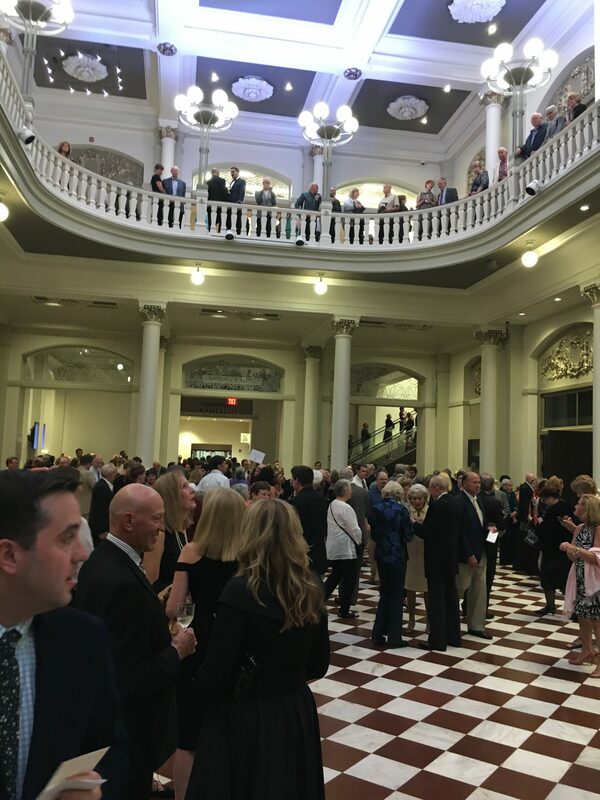 While much of Cincinnati busied itself with Friday night high school football, art openings, dining and drinking or cruising NetFlix, an intimate gathering of 2,282 took advantage of the opportunity to witness history. 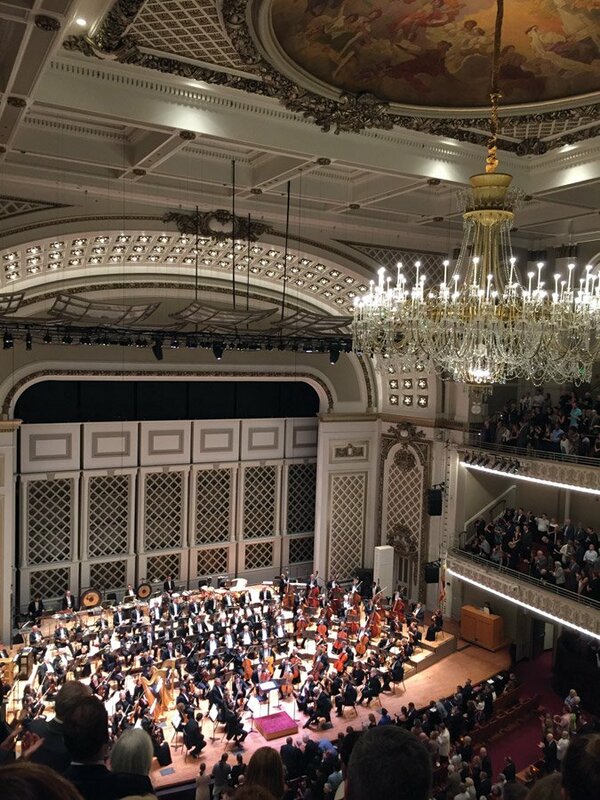 The much-needed, yet highly controversial 16-month rejuvenation of Music Hall was unveiled to a sold-out house, which could barely contain its excitement … even before the Cincinnati Symphony played its first note. 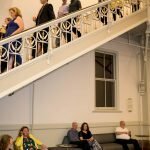 If you already have your tickets, you’ll cruise in the front door as always, but there are now doors all across the front affording you a view of the foyer from all angles of entry. It’s quite grand and inviting. 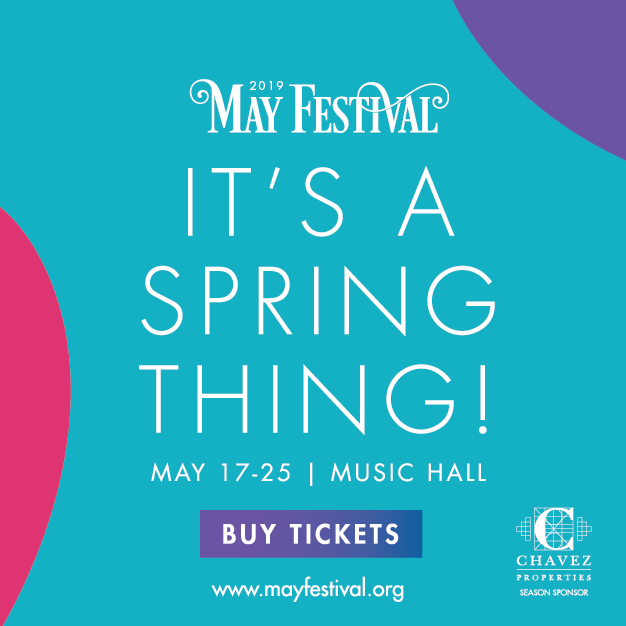 If you need to purchase tickets or have them at Will Call, you enter through the south wing entrance, the way to access Cincinnati Symphony offices and the Music Hall Ballroom. Then you turn right, up the stairs from where bathrooms used to be and immediately arrive in the south corridor, where there is a large bar to your right (in front of the big side doors), the escalator and a new grand staircase on your left, and an unfettered view of the grand foyer straight ahead. No more clumsy doors to open, as the glass barriers have been removed. 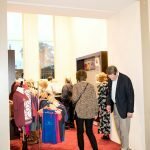 Moving into the foyer itself, the gift shop is immediately to your right, where the coat check used to be. 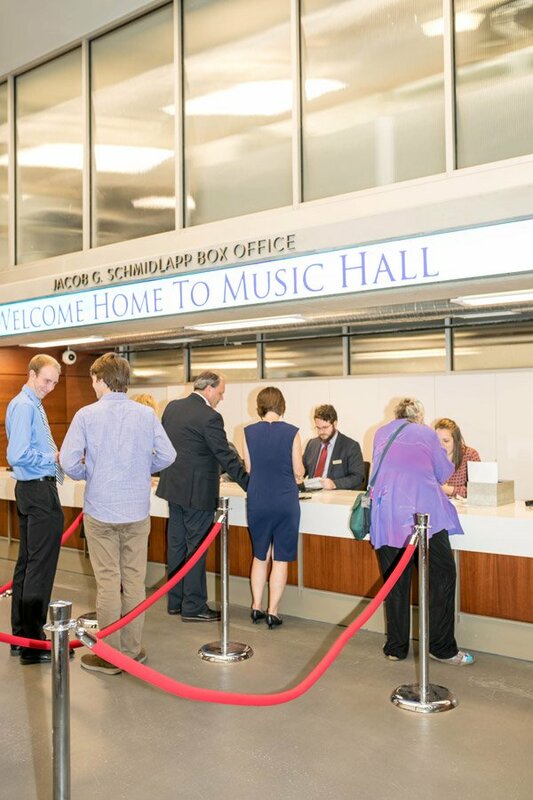 On the center left (where seats were removed at the back of the auditorium) is a new space with comfortable seating for socializing during intermission, and where late-comers may view the concert via video screens until a pause in the action. The walls of this room are currently exhibiting photos by orchestra member Matthew Zory documenting the revitalization of the building. Adjacent was a temporary set-up for Molly Wellmann and crew to offer a signature cocktail inspired by the building’s rose window. At the opposite end of the foyer, the north corridor contains the grand staircase that remains from the previous configuration, plus an identical bar in front of those large east-facing doors. 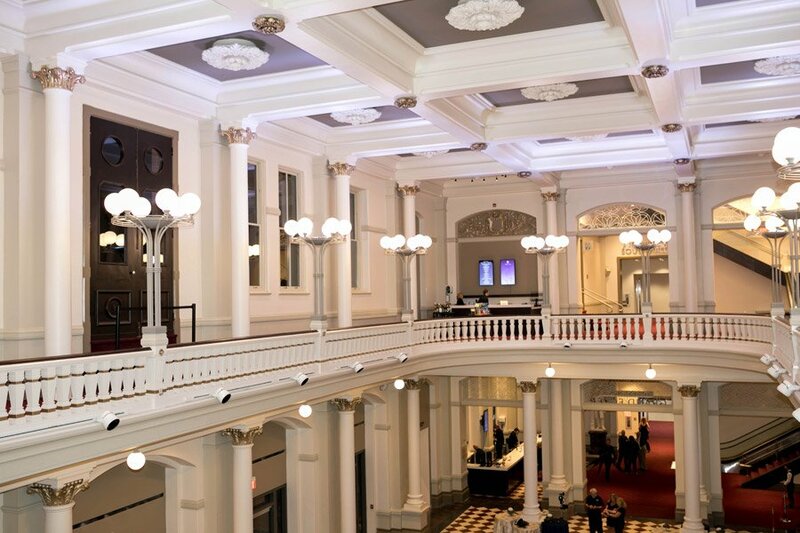 One element that numerous patrons mentioned not liking (derisively calling them “streetlamps”) are the new clusters of frosted globe lighting atop the railing of the balcony overlooking the foyer. Lots of second guessing regarding that design choice. The new spare, monochromatic scheme does seem to be begging for a bit more sparkle and grandeur. The large urn with fresh flowers is gone. The walls are bare, as portraits have been moved to the side corridors. Coming into Springer Auditorium via the south gallery (third floor) was a bit congested, but that could have been because patrons were 1) checking things out and/or 2) trying to figure out where to go. Be advised: At least in the gallery, seating sections have been re-identified. The new raked seating provides better sight lines, especially along the sides, where one’s prior experience was, unfortunately, primarily aural. The stairways are steep, but predictable and solid. Handrails are well placed and secure. The seats themselves are wider, more comfortable and with decent legroom. No more knee-knocking with the row in front, at least for those moderately sized. We settled in the middle of the fifth row on the curve, with a great view almost down into the empty seats onstage, when the public address announcer introduced the orchestra and they came out en masse, as is the style in Europe. The audience rose in a warm, nearly thunderous, ovation. They could barely wait to express their excitement and appreciation. I’m told that this way of entering was an experiment. Apparently, there is a wait-and-see posture among the players, primarily woodwinds, as to whether a possible quick change in temperature from backstage to onstage might adversely affect their delicate instruments and/or reeds. I hope they keep this, as it stamps what you are about to experience as a joint performance, not as an individual task to complete. Jonathan Martin has been on the job as incoming president of the CSO for just four weeks, replacing Trey Devey. He came to the front and gave a brief, but poignant welcome, expressing his gratitude for his new situation, and thanking everyone from donors to construction craft workers for their contributions to this transformation. He was interrupted several times by affirming applause. Music Hall stage from the gallery. 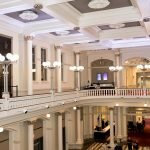 Before we get to the music, a few observations about the auditorium itself. The first thing that struck me was how intimate it felt, without any loss of grandeur. You are right on top of the action. I will have to wait for another visit to hear and see things from the main floor or balcony, but the gallery experience was much improved, visually and sonically. And the top floor has always been the best place to hear. The color scheme is more refined, with rich grays on the walls and ceiling, offset by white trim and rosettes, with plaster detailing remaining gold. The mural above the refreshed chandelier has also been cleaned and brightened to wonderful effect. The new safety railings, likely dictated by code, seem a tad institutional, but who knows what government hoops were required there. House lights were left up throughout the concert, but in no way diminished the warmth of the atmosphere. The young woman next to me commented that she liked the “new car smell” of the upholstery. The orchestra now sits on tiers, higher in the back, allowing for better internal visibility and listening, and likely providing better sightlines from the main floor. Time will tell how this change might affect balance issues, but visually, it is a winner. And time will allow for continued adjustments by the players, themselves, to their new surroundings. 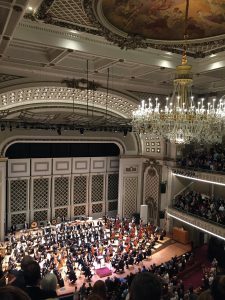 Maestro Louis Langrée entered to more thunderous applause, and he launched the already risen orchestra and audience into the “Star-Spangled Banner,” which was sung and played with much more emotion and verve than I ever remember in Music Hall. 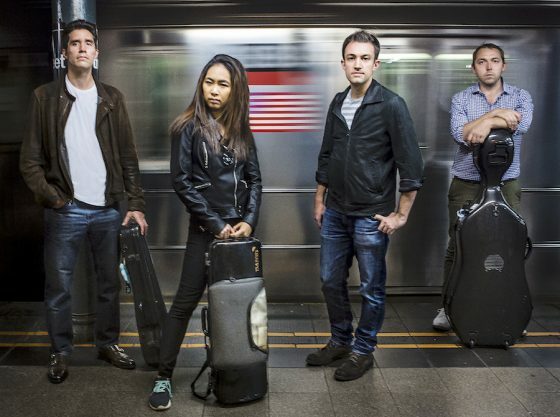 Upon completion, and before the audience was settled in their seats, you could hear the familiar rhythmic block tapping of John Adams’ “Short Ride in a Fast Machine,” and we were off! Langrée conducted like a man possessed, propelling the metaphorical sports car at a torrential pace. This was music the CSO had played several times recently on its European tour, and the musicians attacked with verve. “Short Ride” is only four minutes long, but it’s one wild ride. And a truly satisfying fanfare for the opening of this new performance space. 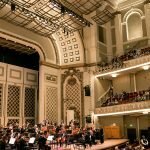 The huge assemblage of players then reduced by seemingly half in preparation for one of Beethoven’s early masterpieces, what Langrée called a tribute to Music Hall’s “classical” and “German” roots. On came pianist Kit Armstrong, at 25 the same age as Beethoven when he premiered the work in 1795. Armstrong was a protégée of pianistic giant Alfred Brendel. His reading was alternately lyrical and fiery, and the contrasts and rhythmic silences in the music really showed the new resonant characteristics in a completely different light. At times, Armstrong’s touch was feathery as a breeze, and you could tell the orchestra was still trying to explore how quietly they could play and still be heard. No longer do they have to project into a massive space; they are already within it. As several of the players have commented, the hall seems bass-friendly, and this translated into warm, resonate celli and basses throughout. Very satisfying. 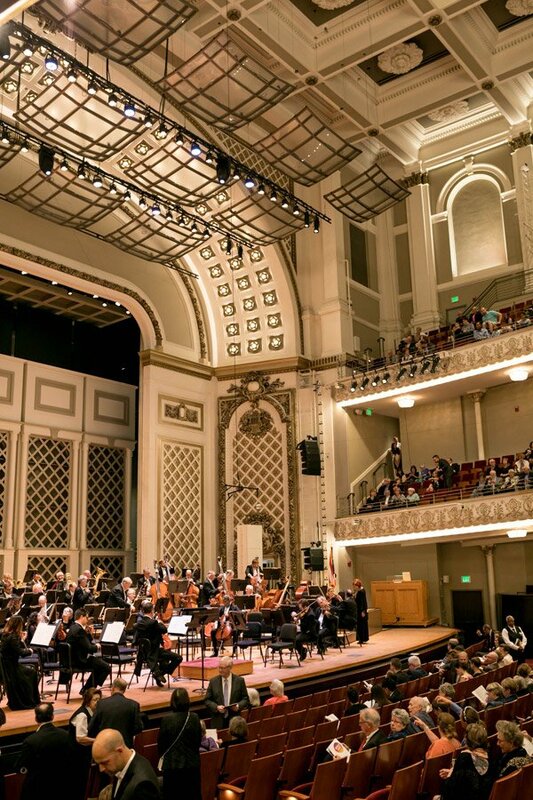 What this sparingly orchestrated concerto displayed is what opportunity now exists in Music Hall to expand the CSO repertoire with smaller-scale chamber orchestra works. The same will be true for Cincinnati Opera in future seasons. Armstrong’s performance was greeted with another standing ovation from the enthusiastic crowd, who coaxed an encore: a Fantasia written for harpsichord or virginal by the late Renaissance composer (and rogue! ), John Bull. Look him up. 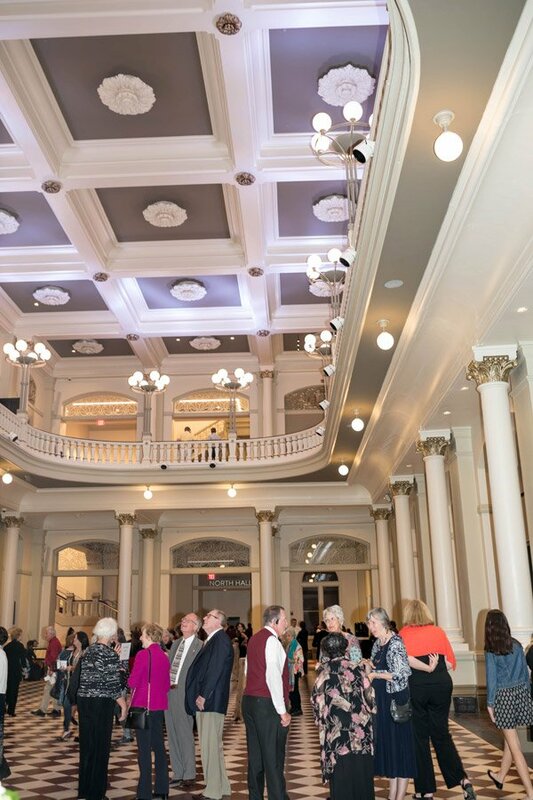 During intermission, we took a quick peek at the newly uncovered ceiling and windows of Corbett Tower, where another concession stand awaits gallery patrons – a welcome addition if the long line was any indication. The new/old ceiling is beautifully rendered, and three chandeliers previously in the foyer have made their way here. I was less sold on the new carpet. But what a treat to look out on Washington Park in all its renovated glory. We were reminded of what it looked like from that vantage point just 6-7 years ago. Langrée addressed the audience prior to diving into the second half, unable to contain his excitement regarding the orchestra’s new toy. A world premiere by Jonathan Bailey Holland, “Stories From Home,” opened part two, an often beautiful and richly textured, atmospheric work intended to evoke the voices of Music Hall’s past. There were numerous haunting effects, especially in the percussion (e.g. 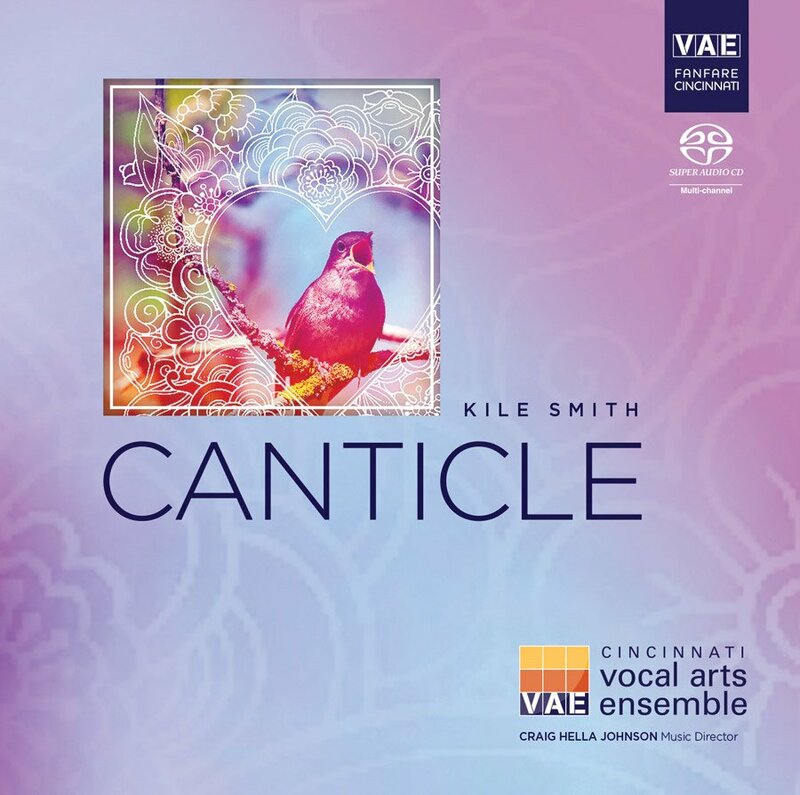 brushing and wiping vibraphones and gongs), and the sonorities were alternately fascinating and glorious, but ultimately, the work left me wanting more of a direction, more of a sense of “story,” not just textures and voices. The finale – Scriabin’s Symphony No. 4, “The Poem of Ecstasy” – was a lush, late-Romantic aural feast. Turbulent, frantic, gurgling, the music is never at a point of rest, always seeking release, but never finding it until the climactic, spine-tingling, seemingly-endless major chord. As the work approached its climax, and a percussionist slammed his hammer repeatedly against a giant hanging pipe, the lights brightened discernibly, adding to the heightened sensation. 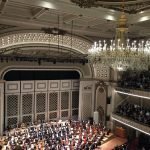 The audience leapt to its feet and cheered until Langrée relented and treated the audience to an encore of Leonard Bernstein’s Overture to “Candide,” a piece with which the CSO thrilled audiences in Europe on it’s recent tour. This was about as rollicking a rendition as I’ve ever heard, as the orchestra was able to relish a piece it now holds deep in its bones. A real blast of a send off. 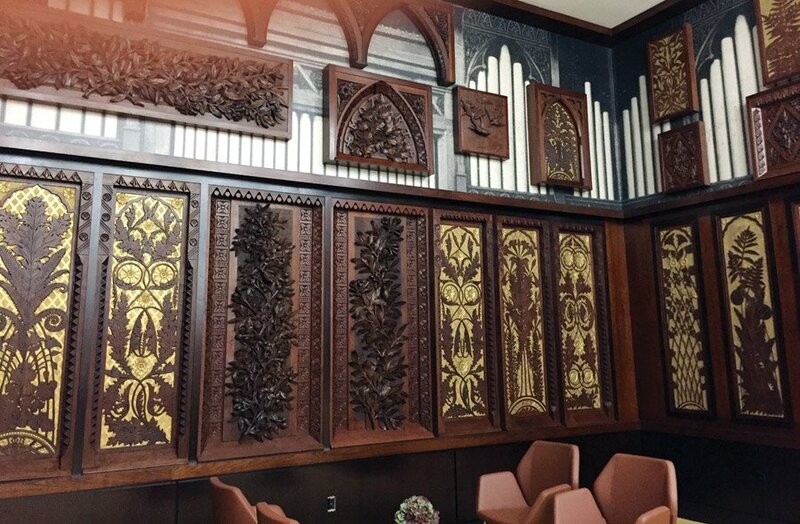 The Taft Room, off the south corridor, replaces the Critic’s Club and features carved panels from the long-removed pipe organ. Post-concert, management wisely kept concessions open so patrons could remain, chat with players and each other, and meet Langrée and Armstrong. 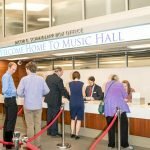 This is an important change, in lieu of previous access to the backstage Green Room, and should help keep audiences engaged and better connected with musicians. A wise decision, although some will miss the lack of intimacy afforded by the previous set-up. What an improvement in the patron experience overall, especially within the auditorium itself. The music has never sounded so rich, so detailed, so warm. Much has to do with everyone being in the same room, but no doubt removing less-desirable seats and bringing in walls to shrink the overall volume has had a huge impact. And seasoning will help the musicians better understand what can and will work…or not. Sightlines are improved. Seats and legroom are more comfortable and generous. So much better for everyone. 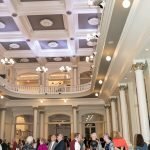 Some who are more visually and historically oriented may complain about certain design elements in the grand foyer, but I loved the open, through-connected feel of the public spaces. 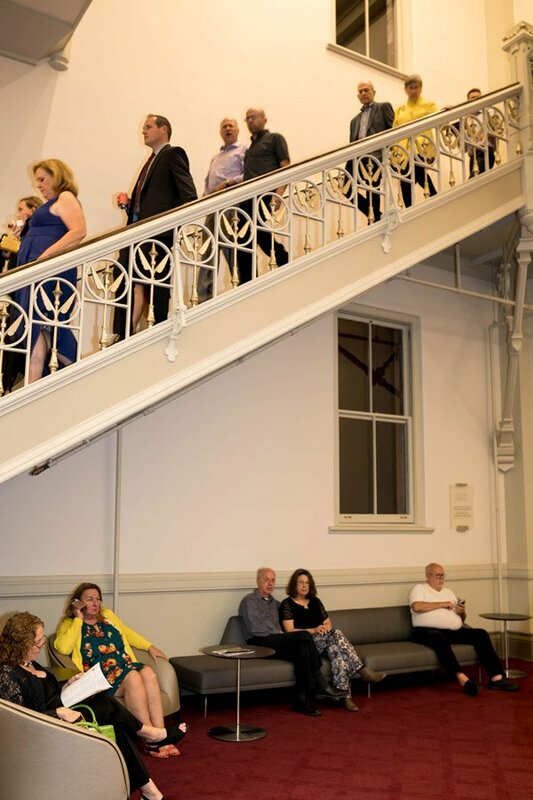 Coming down the staircase following the concert, you are greeted by the sight of people lined up at the bar, planning to hang around, as opposed to fleeing out the side or rear doors. 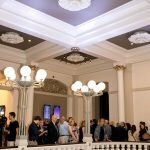 Several patrons expressed disappointment that, at least for those not in attendance at the pre-concert gala dinner, that there was not enough of the spirit of a once-in-a-lifetime occasion. 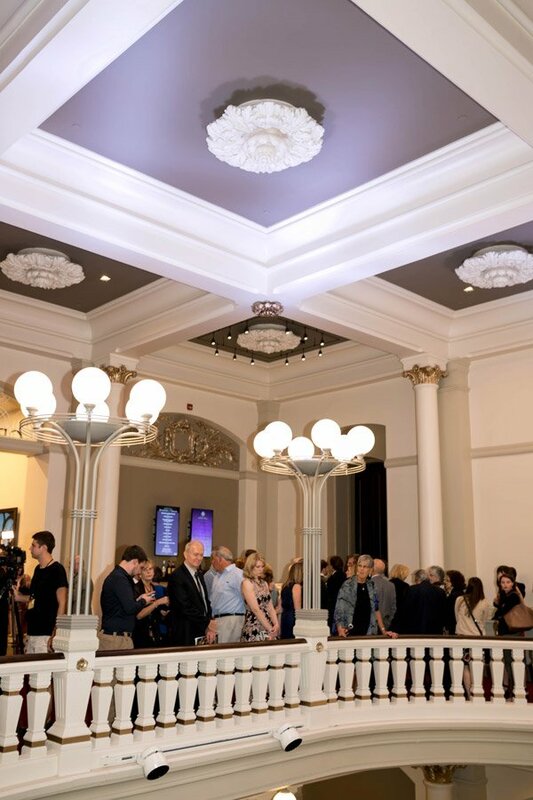 Arriving patrons were presented with a commemorative coin, but there where no flowers, no decorations, no champagne passed afterward, not enough opening-night revelry in the foyer. Even the programming, without the “Candide” encore, seemed more intellectual than celebratory. Several remarked on the lack of choral music – the type of concert for which the hall was built. 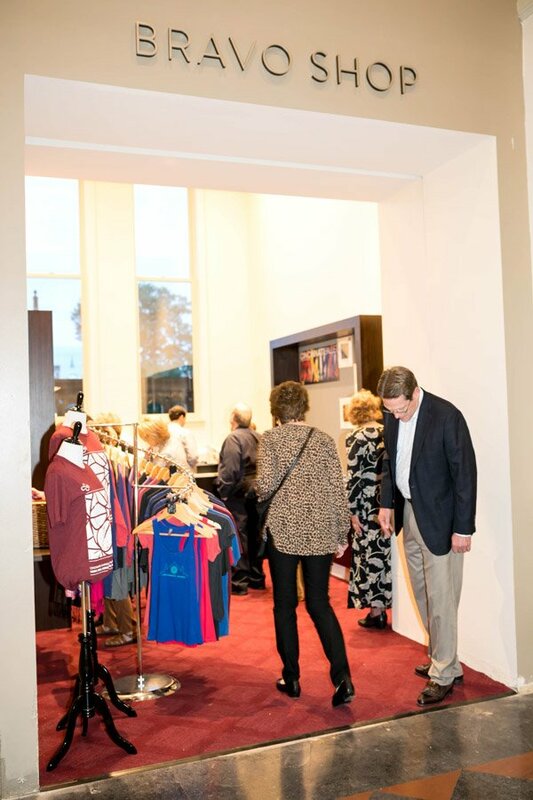 It was unfortunate that any fanfare was possibly compromised in the mad rush to make the space presentable (even clean) in time for the doors to open. Apparently, there is still a fair amount to do, especially back-stage. 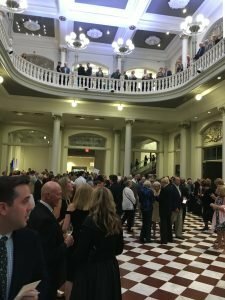 But, overall, it was a thrilling evening, focused on what the CSO does best – make music. 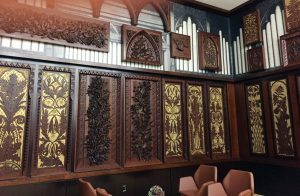 Go experience a new chapter in the history of Cincinnati’s most iconic landmark – our now even more-worthy temple to music. When we left – at about 11:25 p.m. – at least 30 or so people remained. We rode the Red Bike home through the streets of Over-the-Rhine full of favorable impressions and one (just one!) of Molly’s scrumptious craft cocktails. What a difference a decade has made in and around this sacred space. And we’re only getting started. BLINK is next. 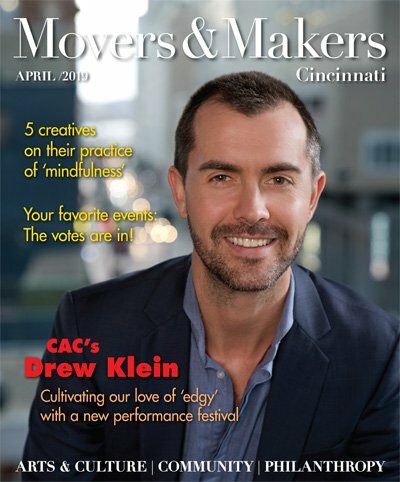 Get ready Cincinnati. For more about some of the behind-the-scenes contributions, read our September cover story on Music Hall.